So this is actually quite interesting; a 13 year old girl has started a Kickstarter campaign to fund her own slasher film. She had me at "no CGI gore". Below are a couple of extracts from the page itself, followed by the link. Read, Watch the video, donate and share. CARVER is a throwback, 80's style slasher film. It was co-written and will be co-directed by 13 year old Emily DiPrimio. 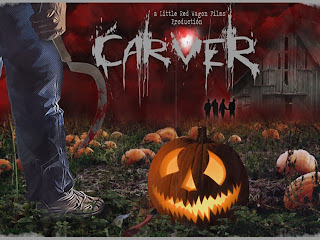 Carver is about a group of teenagers who are haunted by a despicable act they committed on Halloween when they were younger. Their actions caused the deaths of three innocent people. Now, on the anniversary of those deaths, an ominous calling card in the form of a carved pumpkin has been placed at each of their homes. Someone is out for revenge. The question is...who? Carver takes elements from the great slasher films of the past and morphs them into one thrilling story. We know Freddie, Jason, and Michael are the killers in their respective films. While Scream, My Bloody Valentine, and The Prowler keep you guessing as to who the killer may be. In Carver, we introduce a menacing unstoppable killer, but no one will know who is under the mask until the climactic scene. FOUND OUT MORE INFORMATION AND SUPPORT THE KICKSTARTER CAMPAIGN HERE, AND DON'T FORGET TO SPREAD THE WORD!